Fort Bourke Stockade – the Replica! Surprisingly little is known about Fort Bourke Stockade, the only defensive fort in Australia, but this has been no barrier to building a lifelike facsimile near Bourke, in outback New South Wales. Although its a) true dimensions; b) exact location; and c) the building materials used in its construction are not recorded, this tiny stockade is apparently a ‘real life’ replica! Built in 1835 by early explorer Major Thomas Mitchell, historical records contain a few allusions to the short lived stockade, named for New South Wales governor Richard Bourke. The town of Bourke was subsequently established nearby on the Darling River (yet another example of gubernatorial sucking up by explorer Charles Sturt). Driving through the Darling river floodplain on our June 2010 visit to this historic fort, its then recovery after some good rains following many years of drought meant the Darling backwater on which it is built was full. The small size of the fort isn’t just due to its ‘replica’ status either – it apparently WAS really that small – although there is little to confirm this either way. 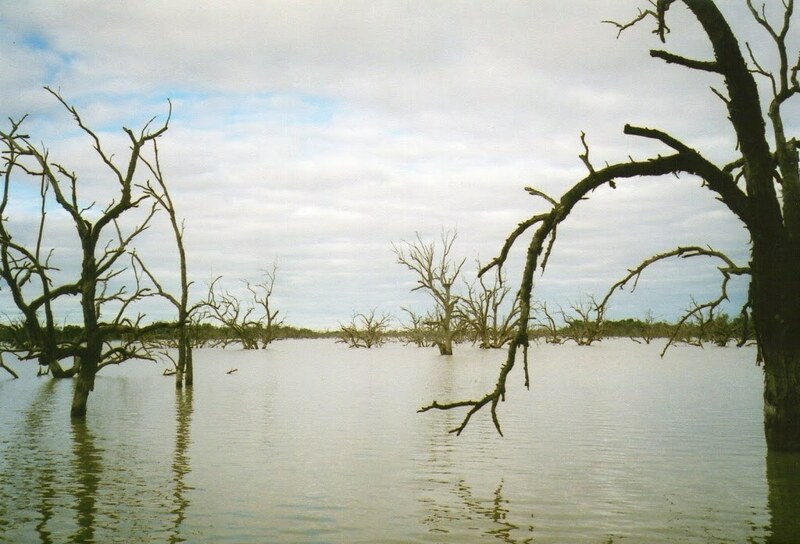 But now, both position and size put it under threat as the floodwaters from Queensland drain into the Murray/Darling basin – a significant agricultural area covering over one-seventh of the country. Northern hemisphere readers who may be making mental comparisons with other famous frontier stockades like Fort Knox, for example, would do well to take a closer look at the top photo! Yes, that really IS a normal sized human being you can see behind the slabs!!! And while the details are sketchy – well, OK, pretty non-existent – it IS apparently the only one of its kind in Australia! And although we don’t know what it really looked like, was made of or where it was, we can ‘imagine’ these things from the ‘replica’!! Governor Bourke would be proud of his fine legacy today – his name features in Australian slang phrase ‘Back o’ Bourke’, used to describe anywhere very remote from civilization! As a historic river port, there is much to interest visitors. Attractions include the nearby Gundabooka National Park, old wharf and restored paddlesteamer ‘Jandra’ – and these, along the ‘Back O’Bourke’ Exhibition Centre just may keep you there for several days! Oh, and did I mention the superb (and also historic) Morrali’s Bakery?!?!? But for us, Fort Bourke Stockade was the standout attraction – where else but OZ would you find something so unique and bizarre? « Signs #9 – Happy Campers! @~Cheryl – If it’s a true replica, I’m not quite sure what the fort would actually protect you from!! @Gina – Welcome and thanx! Look forward to catching more of your parents’ shenanigans! thank you for stopping by my blog 🙂 I am now following you. I am glad to see that you are ok. I have read alot of your blogs very nice …I love the pics your posting. @Veronica Lee – well, girl! With comments like that, drop back anytime! No, make that ALL the time!! @Design Elements – Welcome and thanx! Bet they look a bit different to Bulgaria!! @LESAPEA MUSINGS – My pleasure! Drop back anytime! I loved catching up with you. Thank you for stopping by my blog. I just saw your blog on the over 40 link. It is interesting to see what people get up too all over the world. I have a blog set in Zurich Switzerland. Hope you can check it out! OMG! I love,love, love the pics!! Such interesting facts too. Thanks for sharing. @Betty – it’s actually Sunday night here in OZ, but I’ll take your good wishes for Monday! Another great post! That historic fort is so interesting. Thank you for posting this great info and those beautiful pictures. Have a great Sunday or Monday! @Jayne – you’re too kind! Hope the fort survives the floodwaters – the Bourke floodplain is pretty extensive. @Manzanita – thanx so much, hope you continue to enjoy your visits! Now, heading over your way to satisfy my curiosity!! @Karen Mortensen – Thanx! All done with a non-digital camera!! @Katie – it’s a gift! Seriously, Blogger makes it all so simple – I insert the pictures into the text and align them right, left or centre! Nothing to it – but I won’t be developing my own website anytime soon, with Blogger I don’t even have to think about how to do it! @SpookyJulz – Welcome, and thanx! Maybe you’ll make it to OZ one day, but if not, following my blog is the next best thing!! @Windsmoke – Welcome to you too! One day I’ll make it to Benalla – but it’ll be hard to write that one up with a new angle!! Ned Kelly’s jail cell in Benalla, Victoria is the real deal and is much bigger than this tiny stockade, fantastic photos to. Thanks for following me from over 40. I love your travel blog!! I may never get to Australia but, I can enjoy it through you!! How do you layer your pictures like that?? I am excitedly delighted that you announced yourself to me. I can’t begin to tell you how much I love history and your blog brings it smack into my curiosity. I’m a little tight for time right now but I want to go back and read all your posts. And your expressions. Back O Bourke…… I’m going to make that one my own (after I use it 3 times). Mitchell built this Fort because he’d had bad relations with the aborgines…. uuummm, wonder what that was about, don’t you? I am looking forward to reading more of your adventures and history.They’re great !!!!! From my blog, Wanna buy a duck. It’s just a name that’s a bit unusual from an old expression from the 1920’s. A lot of people have asked about the name so I did write a short post with an old film clip about the name on Dec 10, 2010 Name of that post is “I Take Thee….. For My Blog.” It’s there for you to read if you have the time. Thanks for asking. Was just blogging about the flood waters of the Darling hitting the Murray, and while I knew of this fort I’m hazy on the details so I won’t correct you lol. Bourke was the boss cocky, Burke was the burk who buggered up a good walk in the bush. @Andrew – If my facts are wrong, then some pedant will let me know pretty quickly!! Same goes for misspellings! So go on! Treat yourself and throw in a BOB comment NOW!!! I shall worry even less in my blog about checking facts now. If councils can take such liberties with supposed facts, so can I. Btw, I so wanted to slip a Back o’ Bourke comment in. Given I would have probably spelt it Burke, it is just as well you did.